Wasn’t Steven Cushner just here? It was only six months ago that the Washington-based painter mounted his most recent show at Hemphill Fine Arts, a series of works on paper alongside a painting show by William Willis. With “The Shaped Paintings, 1991–93,” Cushner returns with a series of deep cuts from his own extensive painting catalog. These are works that George Hemphill believes deserve a second chance: According to the gallery, reviewers didn’t take to these post–Color School paintings on nonrectilinear canvases the first time around. Twenty years later, Cushner’s work still needs time—but then, his paintings have always demanded first, second, and third looks from viewers. 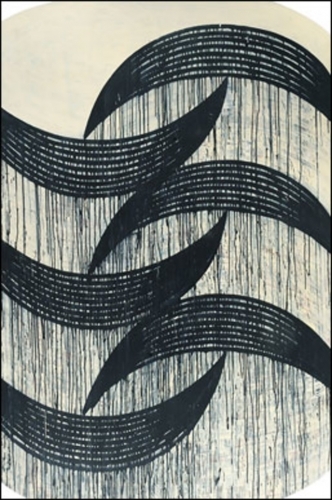 Stripes, stains, and drips define his work, and for these particular paintings, his typical concentric forms also shape the frame. But regardless of how radical a departure these canvases may seem for Cushner, his work still grapples, at least partially, with the Color School style that debuted half a century ago.